Virginia’s Blue Ridge is an incredible destination for those who love to rip a trail on a mountain bike. No joke! 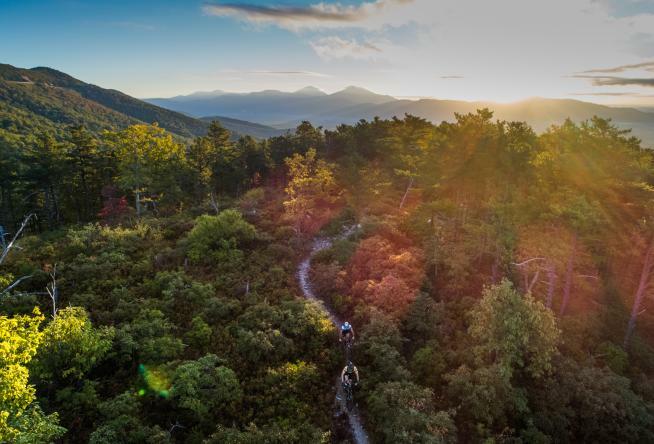 We scoured popular mountain biking websites to unearth those that are considered to be the top 10 trail systems for epic mountain biking in Virginia’s Blue Ridge. If you’re ready, let’s roll through America’s East Coast Mountain Biking Capital. Just 10 miles from downtown Roanoke, Carvins Cove Natural Reserve is a 12,500-acre paradise for those who love the outdoors. Aside from the Appalachian Trail access and the 630-acre glistening reservoir for paddlers are the rad trails. Five in particular have risen to the top as tough but loved. - The Gauntlet is a two-mile, 1,000-foot downhill toward the reservoir. Or if you have legs of steel, a mighty 1,000-foot ascent toward Hi-Dee-Hoe. - Hi-Dee-Hoe is a switchback lover’s delight at 1.5 miles of ups, downs, and spin-arounds. Pick it up off The Gauntlet or straight off the Bennett Springs parking lot. - Rattlin’ Run is also accessed from Bennett Springs parking lot and is one of the toughest trails in the Reserve. At 2.28 miles, it leads to Songbird, an easier trail in comparison. - Songbird is possibly the fastest trail in the Reserve and is nearly two miles long. It’s not as much of a switchback, leg-killer as Hi-Dee-Hoe but we think you’ll enjoy it. - OG is a tremendous downhill trail that&apos;s known for having the best jumps at the Cove. It&apos;s only 1/2 mile long, but is a must-ride for those wanting to experience the best of this challenging trail system. You can also check out The Gamut - a 2-stage route that provides the opportunity to ride every trail at the Cove. Mill Mountain is a “must visit” for anyone coming to Roanoke for any reason. It’s where you’ll find our iconic Roanoke Star and Mill Mountain Zoo. It’s also a pretty great trail system that’s open to mountain bikes. Oh, and it’s within the Roanoke City limits. The Full Pull is the entirety of the trail system, starting and ending at UnderDog Bikes at the base of the mountain. Expect to cover 13.5 miles and tackle more than 2,100 feet of elevation. Fun times with lots of climbs! Known for being a popular spot for 4x4 off-roading, the Potts Mountain Jeep Trail is also a thrilling challenge for mountain bikers. It&apos;s a technical ride along the ridgeline over rock outcroppings and boulders, but you&apos;ll also encounter a few scenic spots that provide a view of West Virginia on the horizon during your 7.5 mile trek. The Roaring Run Recreation Area is more known for its easy waterfall hike, but mountain bikers can take advantage of the challenging Hoop Hole Trail Systems. The Upper Hoop Hole ride provides nearly 6 miles of trails that require riders to conquer over 2,500 feet of elevation change. Ride the rocky ridge of North Mountain and you’ll understand why it’s called Dragon’s Back. Coming in at around 12 miles in length, the elevation fluctuates from 1,750 feet to a high of 3,051 feet with plenty of technical rock climbing along the way. An expert level 2.8-mile, narrow challenge, Spec Mines Trail climbs to a ridge and dances along it for a while before dropping fast to the fire road below. Hold on tight and be ready to put your skills to good use. Ninety percent of the 13.1-mile Pandapas Pond Challenging Loop is singletrack. Comprised of multiple loops to create a worthy ride, be prepared for mud and ruts due to the fact that the multi-use status allows horses to ride as well. Just off the Blue Ridge Parkway the Dody Ridge adventure begins and ends at Black Horse Gap fire road near Day Creek parking area. “Perseverance” will be your word of the day as you climb, try not to veer off course while soaking in the beauty, and manage gravel tangles. It’s a tall task, but you’re up to it, right? Combine some of the aforementioned trails with a few others and you’ve got yourself the Blue Ridge Parkway Epic Loop. Glenwood, Mineshaft, Spec Mines, and Dody Ridge together equal 36 miles and more than 5,000 feet of elevation changes. Serious inquiries only for the RockStar Trail. At a shade over 280 miles, this route is an epic Shenandoah Valley bikepacking adventure through George Washington and Jefferson National Forests into Virginia’s Blue Ridge. Be prepared for some challenges along the way with nice ascents, some quite steep. Douthat State Park near Covington is suggested as an ideal overnight location. 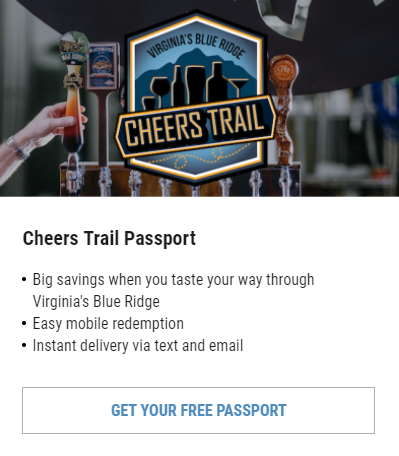 We’ll have the craft beer waiting for you in Roanoke. It will be well deserved.